Progression is a shining example of how hard rock can coexist with Celtic and roots rock forms. 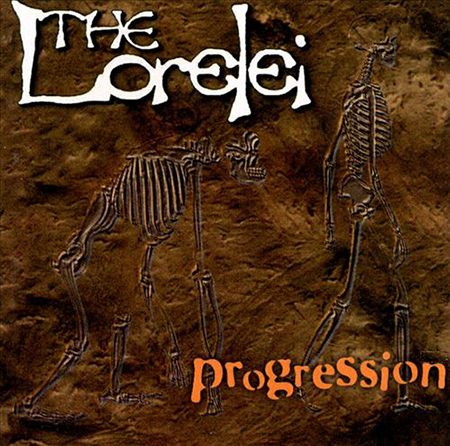 From Scotland, the Lorelei excel in conjoining their love of guitar-oriented rock, Scottish fiddle music, and post-punk angst and enthusiasm. Lead vocalist and songwriter Martin Watson conveys an authority and versatility of voice that Celtic rock bands with lesser singers, like Tempest and Oysterband, can only dream of. This album runs full tilt from beginning to end. Even the slower selections possess a measurable intensity that prevents this album from getting bogged down. That’s attributable, in part, to guitarist Beefy’s ability to adapt to changing tempos and his willingness to allow the acoustic guitar, mandolin, and viola to be heard regardless of the conventional dictates of the song. Even though the viola is present in every selection, and is played in a traditional Highland fiddle style, this is much more a rock & roll record than a Celtic one. The mandolin is used for accent purposes, but it’s the commanding lead vocals and electric guitar coupled with an authoritative rhythm section that drives these songs. “Fluffy Cabbage,” “Sweet Suzi Summertime,” “Buy,” and “Float Across the Sky” are examples of how the Lorelei can comfortably alternate between quirky folk-rock, anthemic rock, hard rock with a Turkish flavor, and alternative rock à la James and the Waterboys, respectively, without alienating the listener.